Fatima (ع) Daughter of Muhammad (ص): Fatima (615 – 632 A.D.), mother of the Imams (ع), is the daughter of the Messenger of Allah (ص) by his first wife, Khadija daughter of Khuwaylid, may the Almighty be pleased with her. 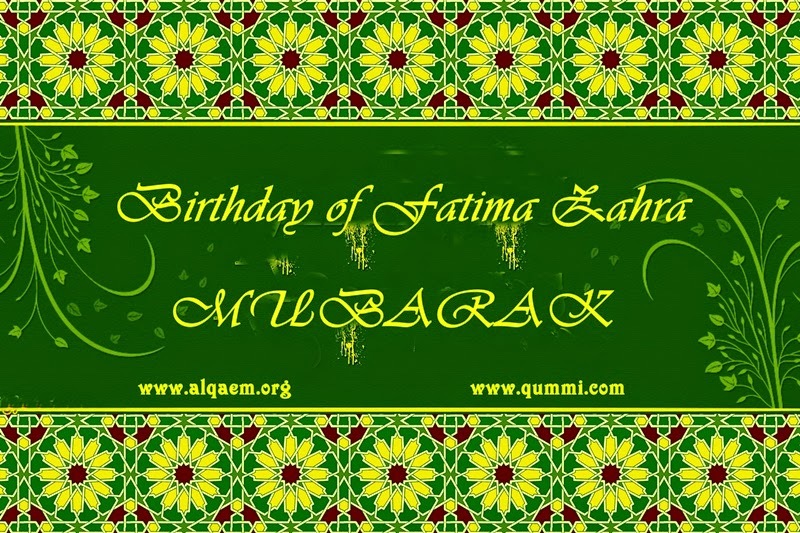 Fatima was born in Mecca on a Friday, the 20th of Jumada II in the fifth year after the declaration of the Prophetic message which corresponds, according to the Christian calendar, to the year 615. She was only 18 and 75 days when she died in Medina few days only (some say 75) after the death of her revered father (ص): The Prophet (ص) passed away on Safar 28/May 28 according to the Christian Gregorian calendar, or the 25th according to the Julian calendar, of the same year. Fatima passed away on the 14th of Jumada I of 11 A.H. which corresponded to August 7, 632 A.D. She was buried somewhere in the graveyard of Jannatul-Baqi' in Medina in an unmarked and unknown grave. According to her will, her husband, Imam Ali (ع), did not leave any marks identifying her grave, and nobody knows where it is. According to Shiite Muslims, she was the only daughter of the Holy Prophet (ص).